Try my easy eye pillow pattern to make a quick (and soothing) eye pillow that stays comfortably in place while it blocks out the light. You'll find it's easy to customize this eye pillow pattern to suit your needs. These little eye pillows are made from just a few scraps of fabric sewn together to create a pouch that's filled with either flax or rice. Both of those ingredients drape nicely over the eyes, adding a bit of weight without being too heavy. We added dried lavender blossoms to my pillow. The blossoms are soft, and won't protrude through the fabric. Other fragrant dried blossoms can be used, too. 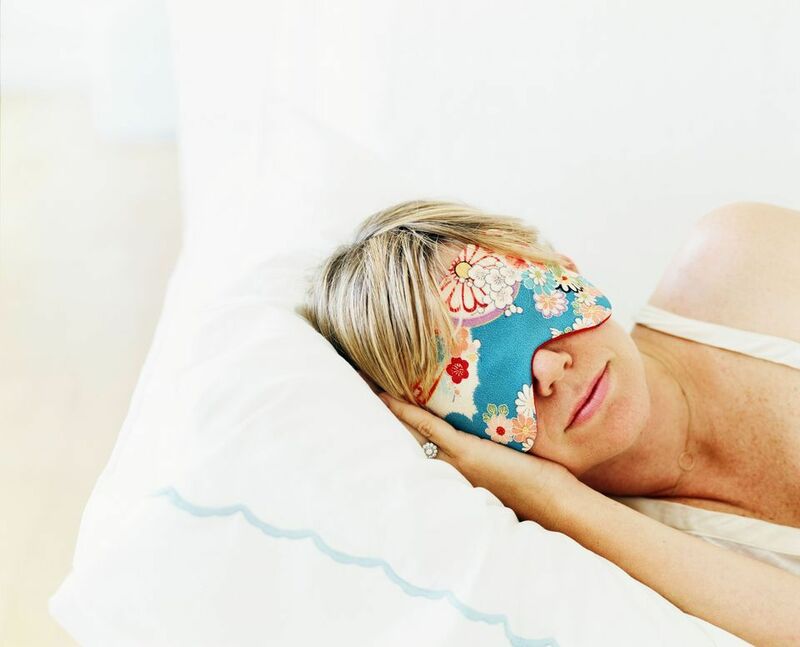 Before you begin, download the Eye Pillow Template. Sew pieces together with a 1/2" seam allowance. Use any type of soft fabric to make the pillows. Cut out the template and pin it to your fabric. Cut two pillow pieces. Place the eye pillow front and back right sides together, aligning all edges. Secure with straight pins. Start sewing along the top (straight) edge, about 3" from a curved corner, backstitching at the beginning of the seam. Sew around the pillow, stopping about 2" from your starting point. Backstitch and remove from the sewing machine. Make 3 to 4 clips straight into the seam allowance at the lower curve -- the area that will eventually fit over the nose. Turn the pillow right-side-out. Insert a blunt object (a capped pen, the handle of a small wooden spoon, a hera marker or other similar tool) into the pillow and push gently into the seams to smooth any wrinkles. Turn the pillow wrong-side-out again if you need to clip into or trim back seams that are too bulky. Use a funnel to insert flax or rice into the opening at the top of the pillow. Add lavender flowers or another soft herb if you like, but don't overfill. The object is to create enough filler to keep the pillow draped over the eyes, but not so much that the weight is bothersome. If you don't have a funnel, make one by rolling a piece of paper into a cylinder that's larger on the 'fill' end. Turn under the seam allowances at the 2" opening and join edges with a hand or machine stitch. It's easy to warm the pillow in a microwave for a few seconds or place it between layers of a heating pad for awhile before use. If you are making the pillow for yourself, add a tiny bit of essential oil to the ingredients and mix well before inserting into the pillow. If the pillow will be a gift, it's probably best to eliminate herbs and oils unless you are sure the recipient is not sensitive to those items. Pillows can be microwaved for a few seconds to add warmth. Another option -- sandwich the eye pillow in a folded heating pad (a better choice if herbs are used). The finished pillow should be fairly lightweight, but it's fine to replace the plain front with a lightly quilted version. Cut an extra piece of fabric (the backing) from the template and 'sandwich' it with the piece you plan to use for the pillow front, wrong sides together. Reduce bulk by trimming the backing piece slightly, and then centering it on the front fabric. Quilt lightly, avoiding the seam allowance. Do not quilt the pillow back. Finish sewing the pillow by sewing the front and back together as explained above.